Dr. Walter A Thomas Jr, MD is a Doctor primarily located in Thousand Oaks, CA, with another office in Westlake Village, CA. His specialties include Orthopaedic Surgery. He speaks English. The overall average patient rating of Dr. Walter A Thomas Jr is Great. Dr. Walter A Thomas Jr has been rated by 20 patients. From those 20 patients 9 of those left a comment along with their rating. The overall rating for Dr. Walter A Thomas Jr is 4.2 of 5.0 stars. Finding Dr. Thomas was a god send. Despite a questionable prognosis by 2 surgeons he was able to reattach a massive full-thickness tear to my primary shoulder tendon using 7 anchors. His initial review was thorough and compassionate and non-hurried. He totally answered all my wife and my pre op questions. His office staff, especially Kris, went overboard to make sure I had both a coolant pump with shoulder fitting as well as a mechanical chair outfitted in my home at time of surgery. They have called me post op and done great follow-through appointments as well as communicated effectively with my choice of P/T all at a distance of about 110 miles away. I am in no pain, was off meds after the 3rd day and have about 1/3 better reach and mobility and was able to return to work after only 2-weeks down time. Dr. Thomas is simply the best surgeon and compassionate, caring human being you will ever find. Don't even bother with a second opinion. Dr. Thomas and his staff are very professional. After seeing another doctor for a partial tear in a tendon in my arm for over 9 months, I was referred to Dr. Thomas. From the moment I set the appointment , I knew he was different from other Doctors. Dr. Thomas listened carefully and asked many thoughtful questions. He carefully reviewed my case and then suggested a simple procedure. His staff scheduled the PRP injection and before I knew it I was on the mend. An excellent experience provided by all this people. After a year of struggling with my arm, I am now pain free thanks to Dr. Thomas. My experience with Dr. Thomas and his staff was exceptional. Everyone was so helpful and friendly. I got an appointment quickly and Dr. Thomas explained everything. I had a medial meniscus tear and he made me feel like it was something that was easily fixable - and it was. When some physical therapy did not help, we decided to operate. My surgery was scheduled quickly and the whole experience went smoothly. I had my surgery on a Thursday, saw Dr. Thomas on Monday and was in physical therapy on Tuesday and back on my feet. I never had any pain after the surgery. My results were perfect. I would highly recommend Dr. Thomas and, in fact, have recommended him to several people. Dr. Walter Thomas is a Board Certified Orthopaedic Surgeon specializing in sports medicine and general orthopaedics. Dr. Thomas completed his undergraduate studies at Pacific Union College and earned his medical degree from Loma Linda University. He performed his internship, residency and chief residency at Loma Linda University. He then completed a Sports Medicine and Arthroscopy Fellowship at the University of California at San Diego. Dr. Thomas' sports medicine background includes serving as an orthopaedic consultant for Team USA Waterpolo, associate team physician for the San Diego Padres Baseball Club, San Diego Thunder, San Diego State Football Club, San Diego Gulls Hockey Club, and the San Diego State Women's Soccer Club. He previously served as the orthopaedic surgeon to the San Diego State University Rugby Team and the San Diego Thunder Semi-Pro Football Club. 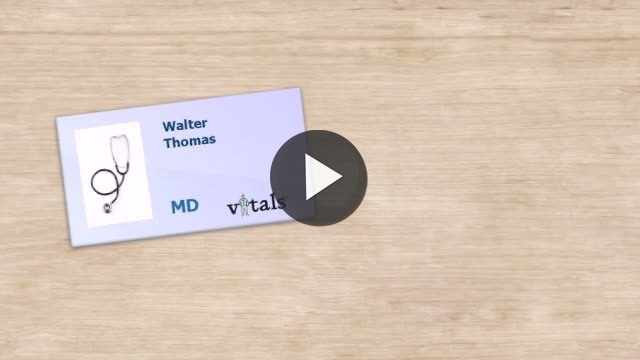 Take a minute to learn about Dr. Walter A Thomas Jr, MD - Orthopaedic Surgery in Thousand Oaks, CA, in this video.